This question is asked a lot and the thread we have on the forum is long, so I though it best to create a how to. If you have edited your core GeoTheme theme then you are doing something wrong and you will need to move any alterations into you child theme folder before carrying out this process, If you are not using a child theme even if you have not customised any files then you need to use a child theme for this process to not loose any settings. I would always recommend backing up both Database and Directories first. You will need an FTP Client. Here are ftp clients that are free any easy to use. I do not recommend using Control panel or any other means for updating GeoTheme. I am using Ipswitch WS_FTP PRO but the same principles will apply. You will need your connection details to connect via FTP. If you are unsure of these details please contact your sites host. Okay so you have a connection via FTP. Now download the latest version of Geo Theme from the Account area at the top of the forum page when logged in. Now save it to a new local folder. The file is compressed so next you will have to extract (Unzip) the files, Right click and extract to here or unzip to here depending on which program you use. Okay now rename the Geotheme Directory on your computer to GeoTheme_New. Open your Ftp Client and in the left pane navigate to GeoTheme_New on your right pane navigate to your sites Themes directory /wp-content/themes. 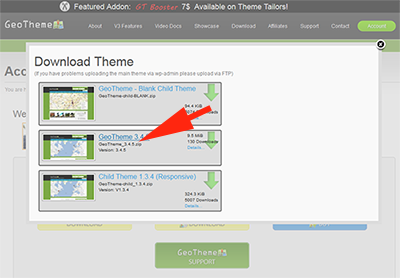 You can now select the GeoTheme_New folder and upload it to the themes directory, This will take some time depending on your connection speed and server. *Note if your connection times out or disconnects whilst uploading then you are best to start again. Now Rename the current GeoTheme folder in /wp-content/themes to GeoTheme_Old and rename the GeoTheme_New to GeoTheme, once this is done you should now be on the latest version, check to see that your site is operating as you would expect. You can for a safeguard download the old version of GeoTheme_Old and then delete this from your server. Congratulations you are now updated. Please if you have any issues then refer back to The GeoTheme forum do not comment here. If you think this can be improved then feel free to comment here. This entry was posted in Geo Theme. Bookmark the permalink. Thanks a lot for this tutorial Tim. You will not find a more helpful, knowledgeable GeoTheme expert than Tim. He’s baled us out more times than I care to think. Even uravelling the mess left by a previous GeoTheme ‘expert’ (who turned out to be a hotel cook).